Following my last post on Edinburgh and as a final before heading back to London, a quick visit to the Forth Bridge. As with Edinburgh, the black and white photos are from 1953, the colour photos are from a rather grey and overcast morning in July 2016. The Firth of Forth cuts inland north of Edinburgh separating the transport links through the city from the north of Scotland. 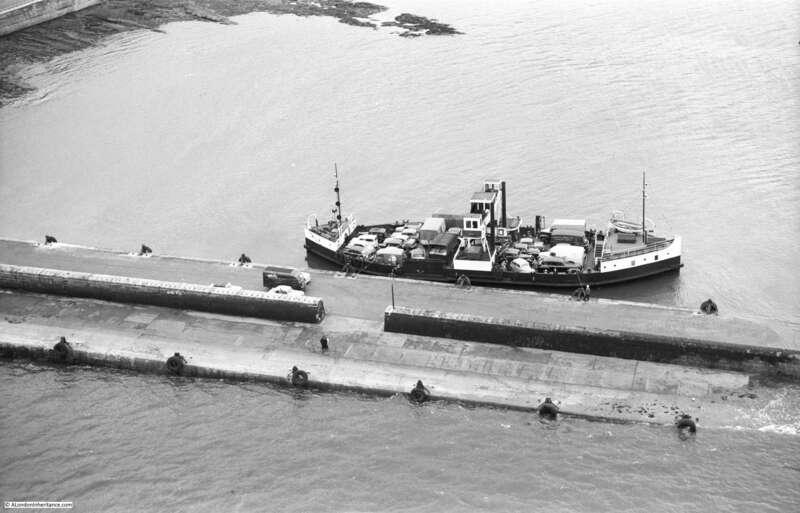 A detour inland was required, or the use of one of the ferries that operated across the Forth. 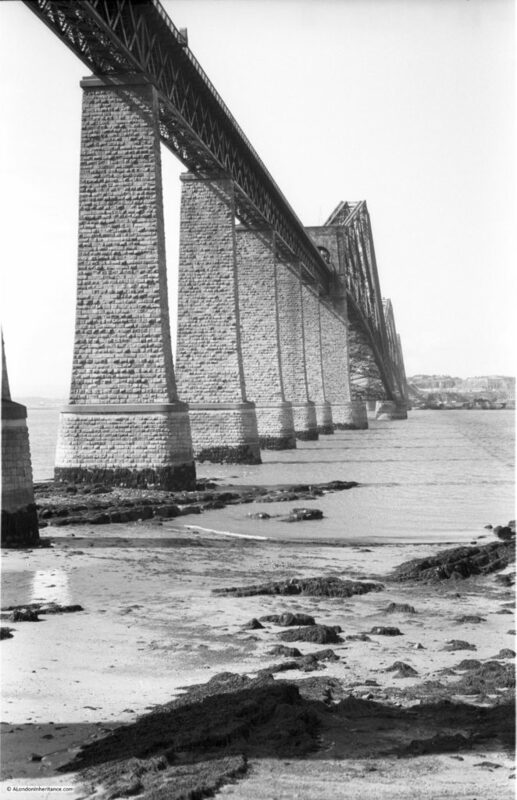 A number of proposals had been put forward for providing a direct link across the Forth during the early part of the 19th century, including tunnels and various designs for bridges, however after the tragedy at the Tay Bridge which collapsed in December 1879, a design proposed by the designer of the Tay Bridge was ruled out and an alternative design for a cantilevered bridge by Sir John Fowler and Sir Benjamin Baker was selected to cross the Forth between South and North Queensferry. 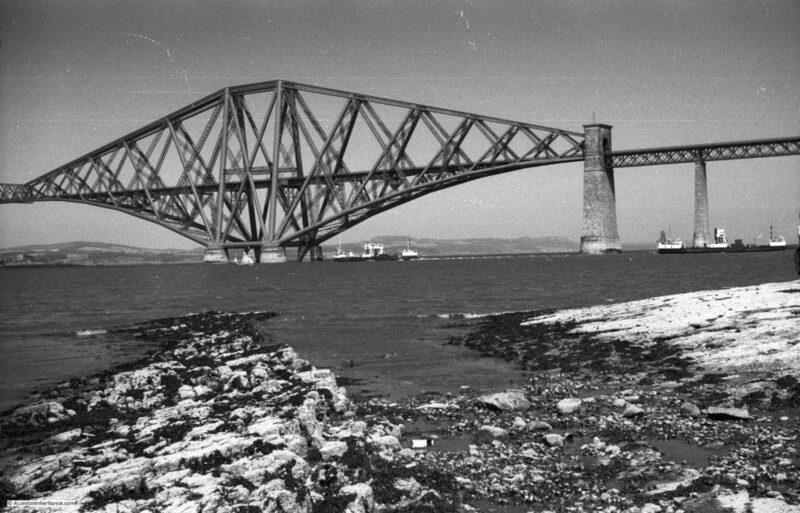 Construction of the Forth Bridge commenced in 1882 and it was opened in March 1890. A remarkably short time for such a construction. 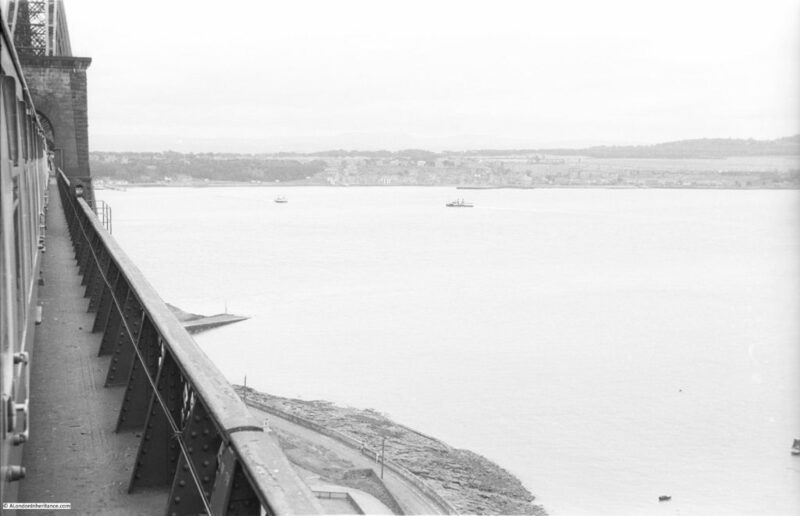 The bridge provided a direct link across the Forth for rail traffic, and in 1953 when my father took these photos there was still no road bridge so a ferry was in operation to provide a route for road traffic and foot passengers. In the photo below, two of the ferries can be seen looking tiny against the bridge. 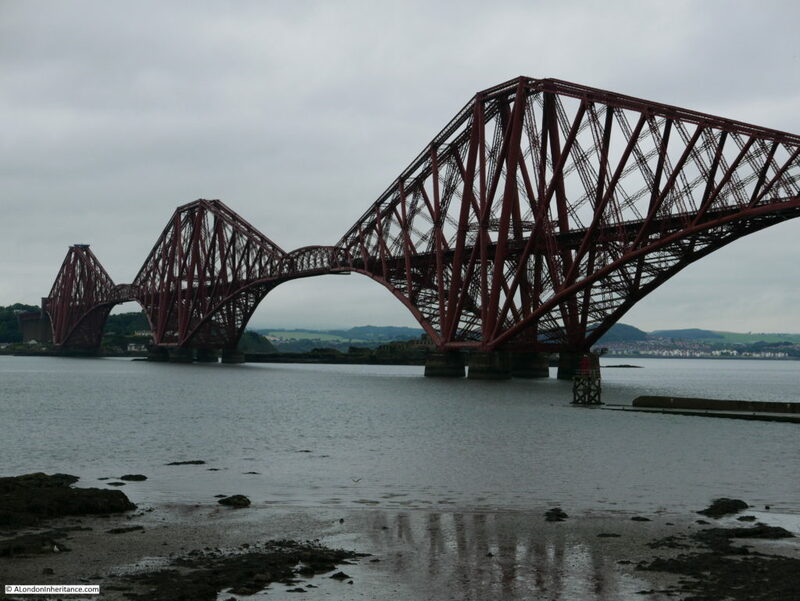 The Forth Bridge today on a rather dull and overcast morning. Even the approach viaducts are major works of construction as shown in the photo below. The box girder section on top of the brick towers is an average of 130 feet above the high water level. The bridge is painted in “Forth Bridge Red” and was last completely repainted during a major restoration of the bridge between 2002 and 2012 when 240,000 litres of paint were used. with a new formula that should allow the topcoat of the paint to last for 20 years. My father took the train across and there are few photos taken from the train window. The first is taken from the foot-way that appears to run along the bridge. I suspect it was taken from the North Queensferry side of the bridge. This photo was definitely taken from the approach viaduct at North Queensferry. 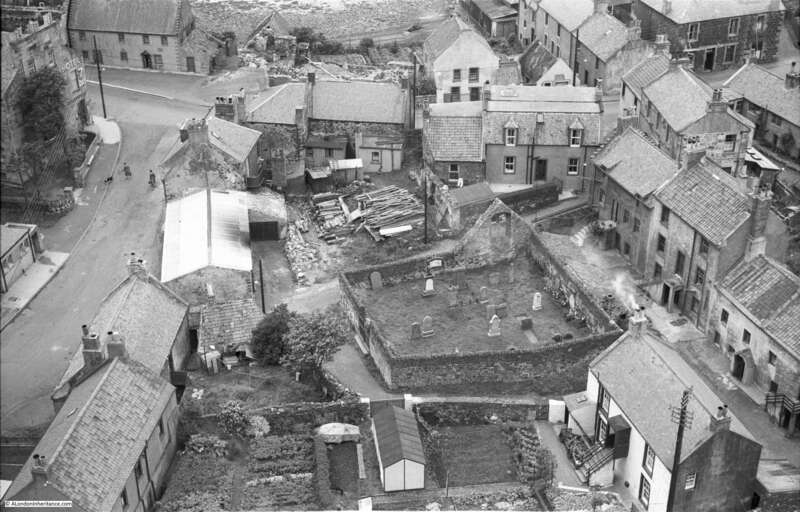 It shows the St. James Chapel Cemetery in North Queensferry which is still there. The following photo taken from the bridge shows one of the ferries that provided a means for vehicles, pedestrians and cyclists to cross the Firth of Forth. 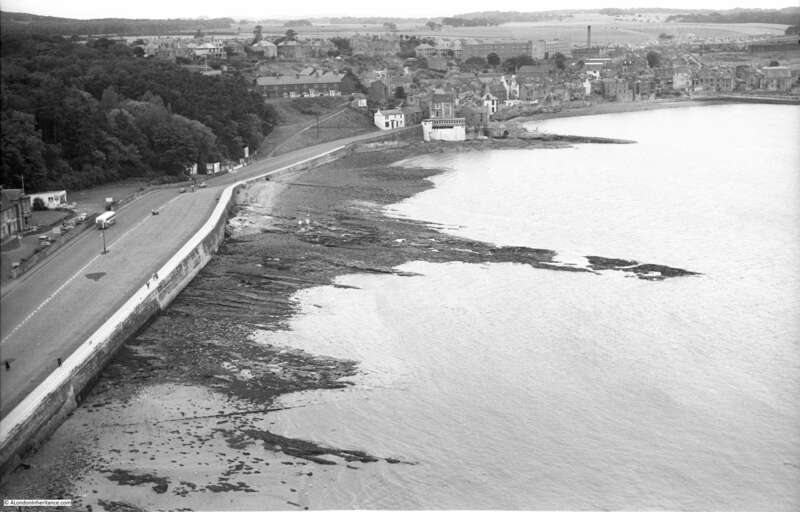 And this photo adds to the mystery as it was taken from the bridge at the opposite end at South Queensferry. There are no other photos from within the bridge so I do not know if he walked across the bridge (and there may have been no photos of this as in these days of digital photography it is easy to forget how frugal you had to be when there were only 36 exposure rolls of film and the costs of film, developing and printing had to be considered), or whether he just walked along the approach viaducts at either side of the bridge. Also, whether there was access across the bridge at this time, or whether he just “found” the walkway open. 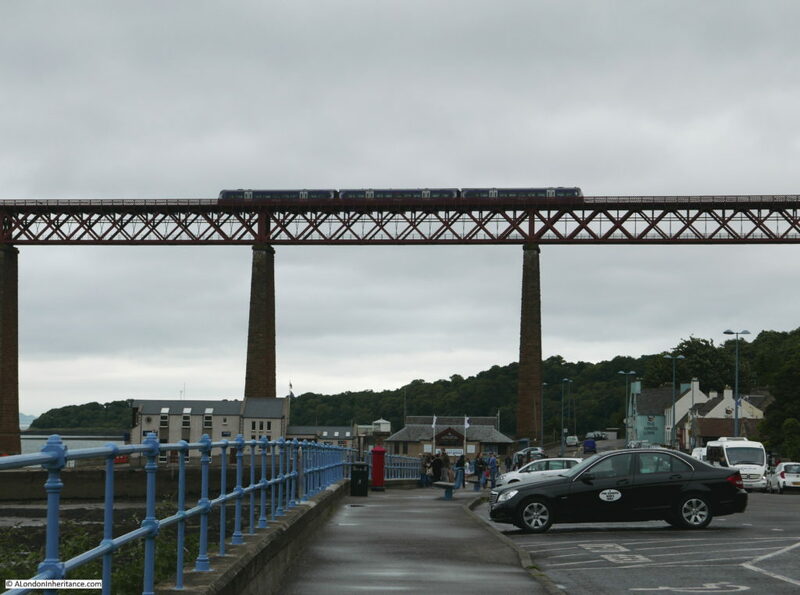 The following photo from 2016 is looking up at the approach viaduct from where the photo above was taken which would have been to the left of the train. This area looks to be much as it was in 1953, a parking area for people wanting to view the bridge. 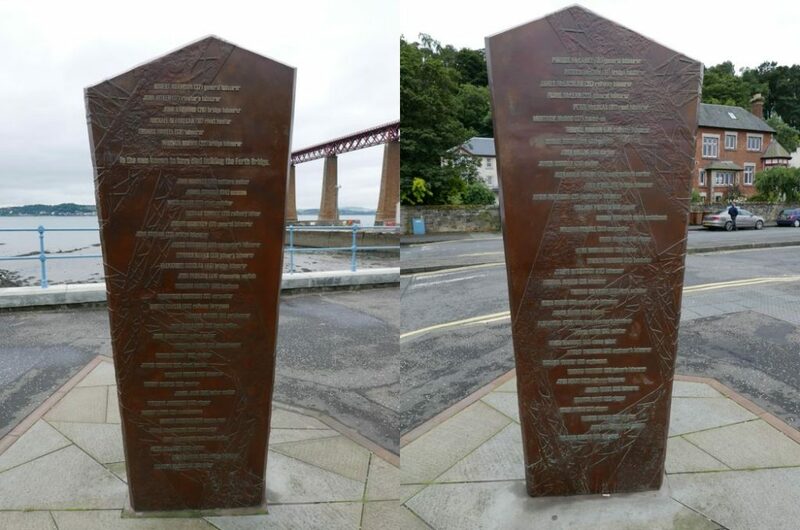 Also on the South Queensferry side of the bridge is a memorial erected in 2012 to those who died in the construction of the bridge. This lists 73 names along with their job such as rivet catcher, rigger and engineer’s labourer. It was a highly dangerous job given the late 19th century approach to working conditions, lack of safety equipment, height of the bridge and the materials involved. There were rowing boats in the water underneath the main work areas to try and help those who fell from the bridge, these boats saved 8 men from drowning. The two sides of the memorial. 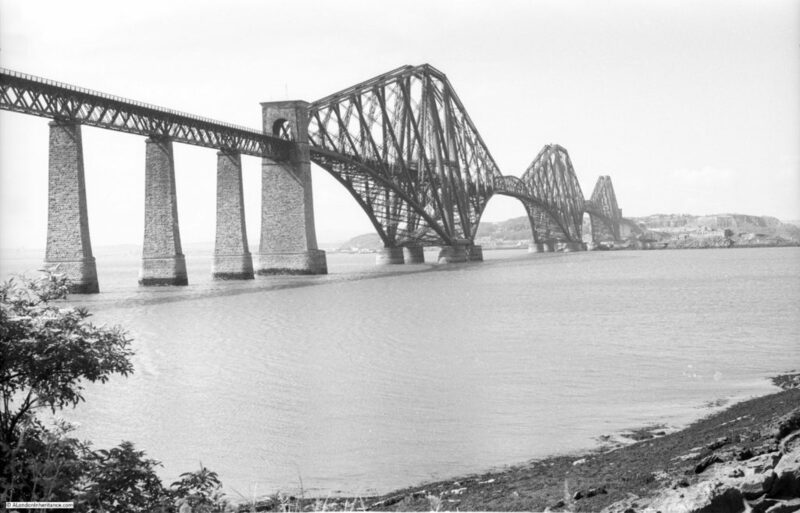 In 1953, the Firth of Forth was only crossed by the rail bridge and as shown in some of the photos above, vehicles, pedestrians and cyclists would take the ferry as the most direct route between north and south Queensferry and the land beyond. In 1964 a road bridge was opened which led to the closure of the car ferry. Traffic volumes across the road bridge now routinely exceed by a considerable amount the original design volumes and in the first decade of this century a range of corrosion problems and loss of structural strength was found across the bridge. This led to a number of temporary closures, repairs, monitoring and restrictions in heavy goods vehicles. 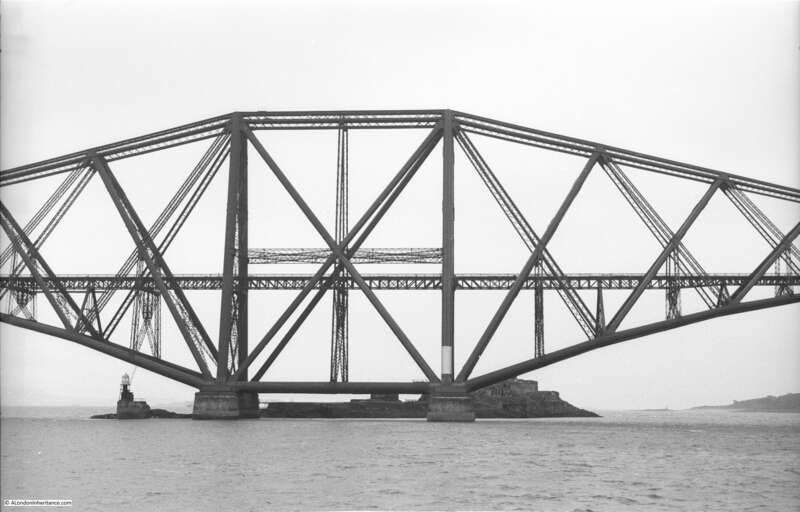 Due to these problems, and due to the increasing volume of traffic crossing the Firth of Forth, a second road bridge is currently under construction adjacent to the original road bridge. These are both a short distance from the rail bridge and can be seen in the following photo. 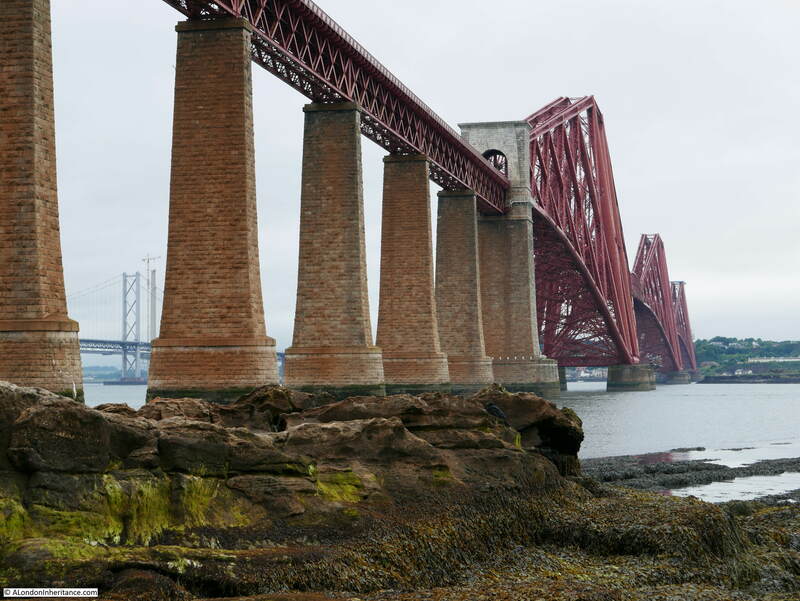 The Forth Bridge is a very impressive example of engineering and construction, even more so considering that the first road bridge constructed some 70 years later has a range of structural problems. 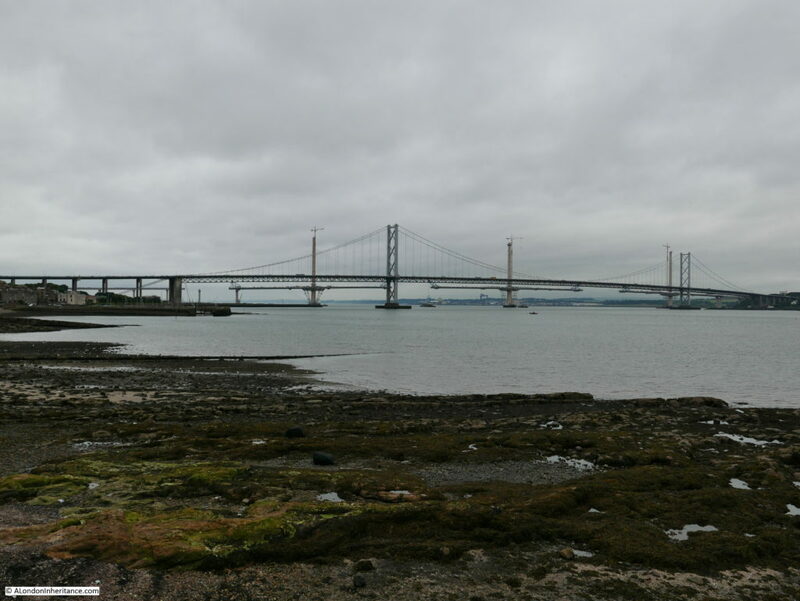 I just wish the weather was not so grey and overcast during my visit and I would also love to know whether my father did walk across all or part of the Forth Bridge. This entry was posted in Cycling Around Britain and tagged Edinburgh, Forth Bridge, Forth Railway Bridge, Forth Road Bridge on September 8, 2016 by admin.